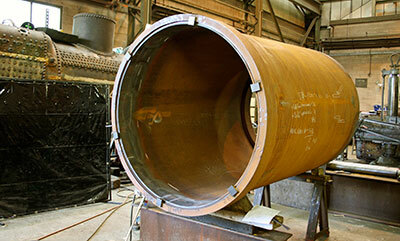 Swaging of the ends of the taper section of the boiler barrel has continued. The larger end which will fit into the firebox throatplate has progressed as far as possible until the firebox throatplate arrives on site and dimensions can be checked. Good progress was then made at the smaller end of the taper section of the barrel into which the parallel section of barrel will fit. Once this end is considered satisfactory the two sections of the barrel can be fitted together and attention turned to marking out and drilling the rivet holes. Whilst this work has been going on it has not been possible to make much progress with the smokebox and its door but this job will be returned to when we have the man power available. The first thing to be tackled will be making a good air tight fit between the door and the front ring that it seats upon following which the hinges can be fitted and the inner liner to the door. As mentioned last month, the cab has been removed from the chassis and partially dismantled initially for completion of welding work on the roof prior to de-rusting in preparation for painting. Arrangements are in hand for painting to begin soon. The portable horn facing machine hired from the West Somerset Railway and very kindly transported from Minehead to Bridgnorth by member Bob Heath is in place between the frames in the centre axle location. We have made some packing blocks to set up the machine and its cutting tool to suit a BR Standard horn face rather than the GWR type that the machine is more familiar with. At Buckfastleigh the pony wheels are fitted on to their axles and at Bridgnorth we have taken delivery of the axleboxes for these wheels. Readers who are also members of the SVR will have received the latest issue of SVR News, which features an appeal leaflet, an article about the project, and a book of raffle tickets for the Guarantee Company's "Slidebars and Crossheads" raffle. Early indications are that there is an excellent reaction to this publicity blitz, and we are hopeful that our bank balance will benefit considerably as a result. Very many thanks to the Company for its support for 82045; to Editor David Williams for his unfailing help; and to those who have responded, or intend to respond, to the appeal and/or raffle. A gentleman passing our Bridgnorth site recently was overheard to say "Bloody hell, I've put money into this and it's going backwards!" I suspect that his disappointment was triggered by the sight of 82045's still-unwheeled frame assembly and by the de-mounted cab lying forlornly next to it, and would like to reassure him - and anyone else who might be wondering what is happening - that appearances are very deceptive: the cab is waiting for our volunteer painting team of Andy Williams and Gary Townley to have some free time to apply their skills it so that it can be re-fitted, resplendent in green livery; the axlebox horn guide surfaces to be finally trued so that the frames can be lowered on to the coupled wheels; the smokebox door to receive minute adjustment so that it achieves a snug, airtight fit with the door ring and barrel. In the meantime, our chaps are working hard, out of sight in the boiler shop, on the boiler barrel; work is under way at the South Devon Railway on the firebox and pony wheels; the pony assemblies are progressing well; and the side tanks are in the charge of the Ffestiniog Railway at Boston Lodge. In short, there is an enormous amount of progress to report, and the fact that this is not at present instantly discernible on the ground should give no cause whatsoever for dismay. This is one of the very best and soundest of the new build projects: our supporters have backed a winner. Onwards and upwards! 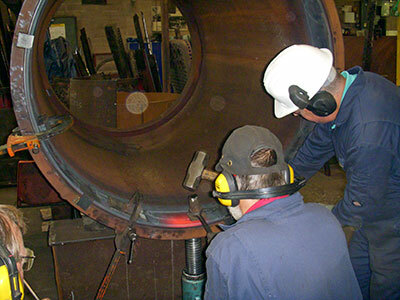 John Pagett and Dave Bates hammering a section of the small end of the taper boiler barrel, heat provided by Tony Wakely. Photo: Martin Managhan. Small end of the taper boiler barrel following work to swage it circular. Photo: Tony Massau. 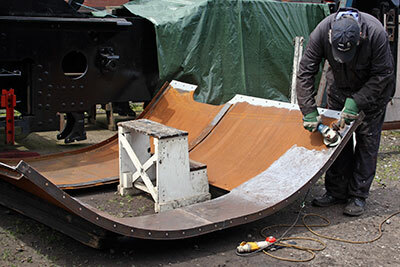 Colin Williams cleaning rust off the inside of the cab roof in preparation for painting. Photo: Tony Massau. 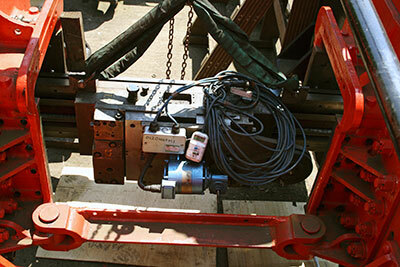 Horn facing machine in situ between the frames. Photo: Tony Massau. 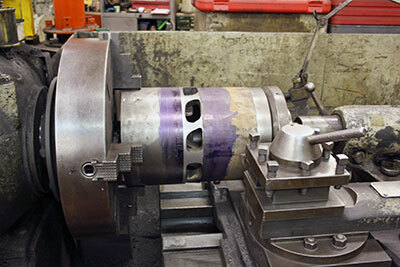 Steam chest liner in the lathe for machining. Photo: Tony Massau. 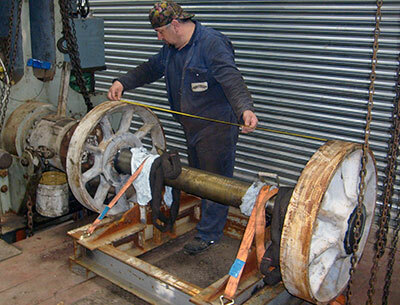 Our pony wheels being pressed onto the axle at South Devon Railway Engineering, 3rd June 2016. Photo: Richard Elliot, South Devon Railway Engineering.